Treetopia’s Primp Your Pet Holiday Photo Contest! Let your adorable furry friends be the star of this season’s celebration! Dress up your pets in a cute yuletide costume, take their photo with your mobile phone or tablet, and join Treetopia’s Primp Your Pet Holiday Photo Contest! We’d love to see photos of your critters – whether they’re mesmerized by your ornaments, munching on holiday treats, running around the house, or just being plain cute! We’ll award the two (2) best dog photos and the two (2) best cat photos with a set of Treetopia’s fancy tabletop trees. Best of all, the winners can pick out which tree they like best. Share your favorite pet photos today! Color Your Holidays with Treetopia! Surround yourself with color and win a Treetopia Christmas tree! When it comes to expressing your love for the beautiful colors of the holidays, you can always rely on Treetopia for the most striking and vibrant Christmas trees to fill your home with the loveliest shades of the season. Show us how Treetopia trees inspire your home decorating style by joining our Color Your Holidays with Treetopia! contest and get a chance to win great prizes. Simply follow us on Pinterest, create a board, and pin your favorite Treetopia trees and other colorful ideas to get the chance to win a fabulous Treetopia artificial Christmas tree! Entry submission begins on November 23, 2013 at 9:00 a.m. PST and ends on December 6, 2013 at 11:59 p.m. PST. Voting will open on December 8, 2013 at 9:00 a.m. PST and close on December 15, 2013 at 11:59 p.m. PST. Anyone who follows Treetopia on Pinterest can join the contest. To sign up for a Pinterest account, go here. A board entitled “Colorful Christmas Inspiration” must be created. Pin any two colorful Christmas trees from the Treetopia website, and add several other pins related to your chosen color theme. The official entry form on the entry page located at http://woobox.com/rsrmnw needs to be completed and submitted. Only one (1) entry per person and per Pinterest account is allowed. Automated entry devices, bots, programs, and software are not permitted for entry. Treetopia reserves the right to disqualify any winner whose winning entry appears to be the result of mechanical reproduction or other violations of the official rules. By participating, entrants agree to be bound by the official rules of this contest. On or about December 7, 2013, Treetopia shall determine the 15 best entries based upon the following criteria: (1) Board aesthetics, (2) Creativity in using Treetopia trees in color theme, and (3) Overall board concept. These 15 entries will be the finalists. On or about December 8, 2013, voting will begin to determine the final ranking of the finalists by user votes on the Treetopia Facebook page. From December 8 until December 15, 2013, Facebook users can vote for their favorite Pinterest boards once every 24 hours. All participants in the contest are allowed to share their entries to spread the word about the contest and encourage friends and families to vote for them, via a Third Party Contest Poll Application. Users may be required to Like the Treetopia Facebook Page before they can vote. The top three Pinterest boards with the most number of votes by the end of the voting period will be declared the winners. The winners will be chosen within five (5) days of the contest’s end. Winners will be notified via email and will be required to complete a Certificate of Eligibility and liability/publicity release within ten (10) days of the date of notification. 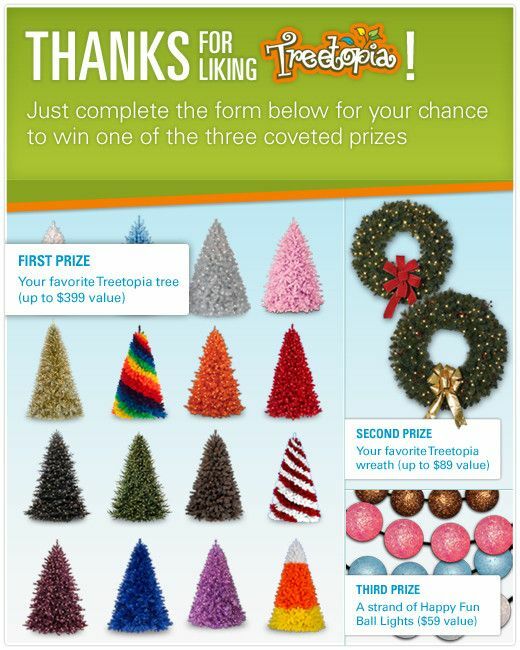 The three (3) winners will each receive one (1) 6-foot Treetopia Basics Christmas Tree with the color of their choice. Each Treetopia tree shall have an estimated retail value no greater than $228 USD, and the total retail list value of all prizes shall not exceed $684 USD. Win exciting prizes and discover more ways to bring color into your home along the way by joining now. Log on to Treetopia’s Facebook page to find out more about our Color Your Holidays with Treetopia! contest. Here at Treetopia, we’re always looking for ways to help you make your artificial Christmas trees look as fabulous as possible. Of course, if you want something done right, you turn to the pros! Our elite Treetopia Design Council is composed of some of the web’s best designers to showcase ideas and inspirations for creating the Christmas tree of your dreams. We’ve asked our awesome assembly of bloggers to choose and decorate their favorite Treetopia tree, and for the next few weeks, we’ll be sharing the spectacular results with you. Here’s a sneak peek at some of these brilliant designers and the Treetopia Christmas tree they will be decorating. Stay with us and discover fun and fashionable ways to bring out the best from your Treetopia Christmas trees. Be a Secret Santa and win a pair of Treetopia Trees! The most wonderful time of the year is fast approaching and we’re here again to help you get on top of Santa’s “nice” list. Join Treetopias’s Secret Santa Sweepstakes and get the chance to win great prizes that you can share with your most favorite person in the whole world! Whether it’s your relative, friend, co-worker, neighbor, or your awesome massage therapist, he or she will love receiving a stunning Treetopia tree to match his or her sparkling personality. By liking us on Facebook and providing a few details about the lucky partner you wish to nominate, you get a chance to win the first prize of a pair of colorful and stylish Treetopia artificial trees! Entry submission begins on November 9, 2013 at 9:00 a.m. PST and ends on November 30, 2013 at 11:59 p.m. PST. Only one (1) entry per person and per email address is allowed from when the Sweepstakes period started. You may only use one (1) email address to enter this Sweepstakes. The e-mail account must be opened prior to the commencement of the Sweepstakes. By participating, entrants agree to be bound by the official rules of this Sweepstakes. The First Prize winner will be selected via random drawing within five (5) days of the Sweepstakes’ end. Potential winners will be notified via email and will be required to return a Certificate of Eligibility and liability/publicity release within ten (10) days of date of notification. The First Prize winner and his or her nominated friend will be awarded a pair of Treetopia trees—one (1) Treetopia tree for the First Prize winner and one (1) Treetopia tree for the nominated friend. Each Treetopia tree shall have an estimated retail value no greater than $298 USD, and the total retail list value of all prizes shall not exceed $596 USD. Give yourself and that well-deserving someone in your life a chance to win a beautiful Treetopia tree this holiday. Log on and like Treetopia’s Facebook page to find out more about Treetopia’s Annual Secret Santa Sweepstakes 2013. A bigger, brighter Treetopia is coming your way! With Christmas just around the corner, Treetopia is buzzing with new plans and fresh ideas to make your holiday season more fabulous than ever before. To celebrate our gorgeous makeover, we’re inviting you to take the Treetopia Challenge for a chance to win tons of wonderful prizes. Simply “Like” us on Facebook, and answer the question of the day to join our daily sweepstakes. Even better, you’ll also get the chance to win our Grand Prize — a brand new, stylish Treetopia artificial Christmas tree! If you enjoyed our fun and fashionable trees before, you will surely love the beautiful look and exciting prizes we’ve got in store for you. Entry submission begins on October 13, 2013 at 1:00 a.m. PST and ends on October 24, 2013 at 11:59 p.m. PST. For the purposes of this sweepstakes, a day is defined as beginning at 1:00 am PST and ending at 11:59 pm PST during the same 24-hour period (each, a “Daily Entry Period”). Treetopia’s computer is the official timekeeping device for this contest. Joining the sweepstakes is easy: Simply “Like” the Treetopia Facebook page. Provide your full name, email address, and answer to the question of the day. Only one (1) entry per person and per email address is allowed each day during the contest period. All entries become property of Treetopia and are non-returnable. Treetopia reserves the right to disqualify any individual who tampers with the entry process or otherwise violates any of the official rules. Daily winners will be determined by random drawing within 24 hours after each Daily Entry Period. The Grand Prize winner will be selected via random drawing within five (5) days of the sweepstakes’ end. Potential winners will be notified via email and will be required to return a Certificate of Eligibility within seven (7) days of date of notification. To twelve (12) daily winners, Treetopia will award one (1) online Treetopia Gift Certificate of $50 USD each. The Grand Prize winner will be awarded one (1) Treetopia tree with an estimated retail value no greater than $300 USD. Treetopia Gift Certificates are valid up to December 31, 2014. Join the fun and get the chance to win great prizes and the Treetopia tree of your dreams. Log on and Like Treetopia’s Facebook page to find out more about our Treetopia Challenge sweepstakes.